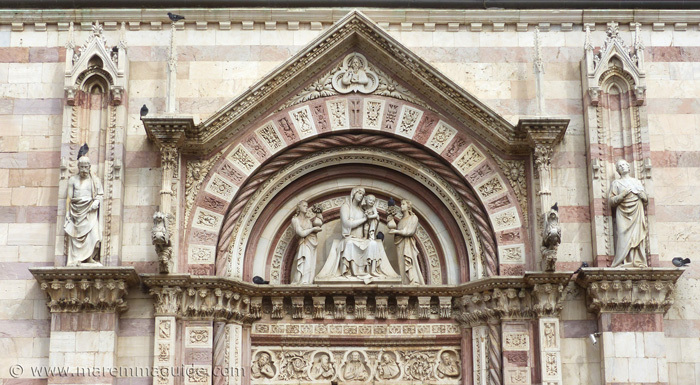 Tourist attractions in Grosseto Tuscany Italy: what is there to see? Well, there is the Medici fortress of course, and the "duomo" (cathedral), but is there anything else worth making a trip to Grosseto, rather than going somewhere else in Maremma? Well, I have to admit that whenever I have been asked by my readers planning a trip to Maremma whether they should take a day out of their precious time here to visit Grosseto, I have always advised them to explore elsewhere for a taste of what Maremma has to offer. Even though it is one of the only places in Maremma to feature in travel guides to the area. 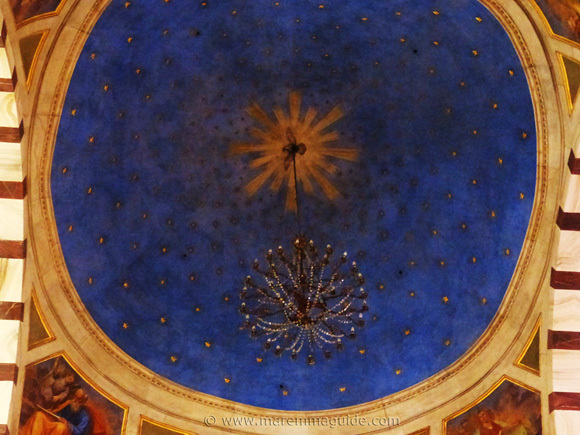 And it's five pointed star Medici walls that enclose its heart are nothing less than stupendous. Even though, as a Tuscany city, it is the most relaxed you will ever experience. In my defence, my motives were because the drive through the city's urban and industrial zone districts to reach its historic centre is far from one of those long dreamt of Tuscany encounters. And then, the getting out of the city once you are in it is just a crazy trial to have to undergo if you don't have to. The combination of one-way streets, signposts that point to everywhere, everywhere. And then disappear. Main routes that take you through tiny pedestrainised shopping centres - and even under its stores past the rubbish bins - are enough to erode into even the best of times spent walking around its centre. And there are so many other beautiful historic towns to visit in Maremma that aren't like that. But all that changed last Friday. I have known for sometime that Natascha, a lovely local cultural guide in Maremma, takes people on a tour of Grosseto city centre on market day every week. A tour that, ladies, includes shopping :) So I asked her if she would take me too. Well, as it turns out I couldn't go on market day, so she took me on my very own 'taster tour' of what she would normally cover during her Thursday city tour. And I can't wait to go back to see more! Why more? Well, the thing is, we took in a second breakfast cappuccino and fresh pastry as well - well, you do, don't you when you are in town - and talked as we walked, and the hours just zipped past so fast we didn't get to see all the things she had planned for me. But I'm not complaining. Far from it. It was a wonderful morning, in a really laid back city, that I gotten to see with new eyes. Now if you ask me whether you should make the trip to see the tourist attractions in Grosseto, I will say yes. Go. But ask Natascha to meet you there and take you on your own private tour to show you around. For most of what Grosseto has to show you, you will miss on your own. Even if they are right there in front of you! And Grosseto's story is fascinating. You will have to read a library of books to touch the detail and life stories there are to know, all of which flow in friendly conversation from Natascha as she guides you to viewpoints here and doorways there, because she has. 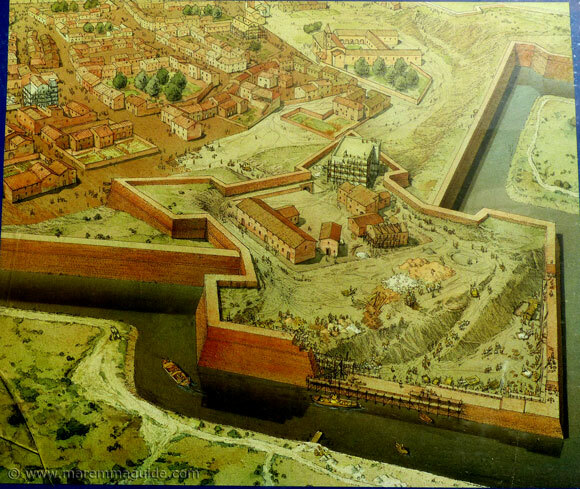 The Medici city walls and bastion under construction between 1565 and 1625, including a navigable moat around the whole perimeter. A tour with Natascha isn't anything like a follow the umbrella in the air, stop here, look there, take photo now, monotone rote repetition of facts and figures, that you may have had the misfortune of experiencing elsewhere in Tuscany. Natascha strolls you around the city and talks with you as you go, filling your head with the story of how it came to be, how one time rulers attempted to have it abandoned but failed as the residents refused to leave. Malaria or not. And, how, when finally the swamps and marshlands of Maremma in which it sat were drained and malaria eradicated, those same residents continued to be so different from the rest of Maremma. Grosseto's Medici tower, rampart and walls as they are now. Kite aerial photo by kind permission of Opaxir. Ask a question of her and a whole other book of wonderful detail about Grosseto and life within its walls will be swiftly condensed into captivating snippets and a diversion or two down a different street to show you something else. 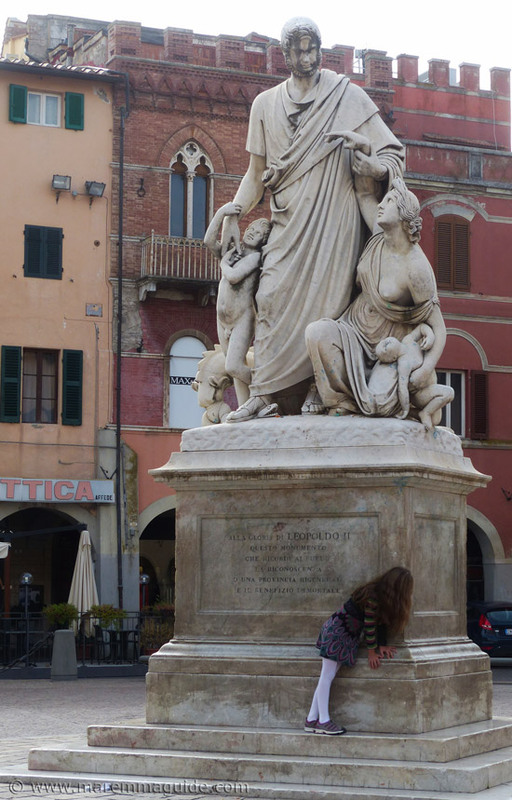 Natascha is clearly one of those lucky people in life who work doing what they love: in this case revealing the lovely city of Grosseto and its treasures to visitors. And it shows. The city has had walls around it since the high middle ages, but those that you see today were built by Cosimo I de' Medici: he wanted a military stronghold and charged military architect Baldassare Lanci to build it for him. Which he did, and his son after him, and a further two professionals after them; for these walls weren't built in a day. Work started in the March of 1565 and concluded in the May of 1593, with the placement of the stone Medici coat of arms above the entrance gate. It was, and still is, a stunning construction. A unique hexagonal fortification, with a walkable perimeter of 2900 metres. With pentagon bastions in the shape of arrow heads on each of its acute corners, and high-up on each of those a guard house. Like figureheads on the prows of ships. 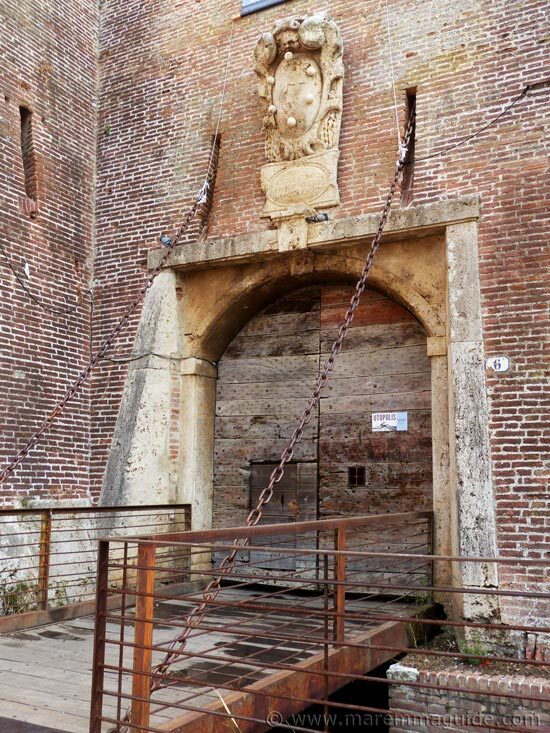 When the fortress and its walls were completed there was only one way in and one way out of the city: the southern and original Porta Cittadina (the only surviving part of a 1262 medieval fortress), at the time called Porta Reale (Royal Gate), and now called Porta Vecchia. Not exactly convenient, but secure. And it stayed that way until 1745. During the Second World War, American bombing of the city in the spring of 1943 (26 April 1943), blasted an opening in the walls, which the city decided to keep. Now Porta Nuova. Today there are four. 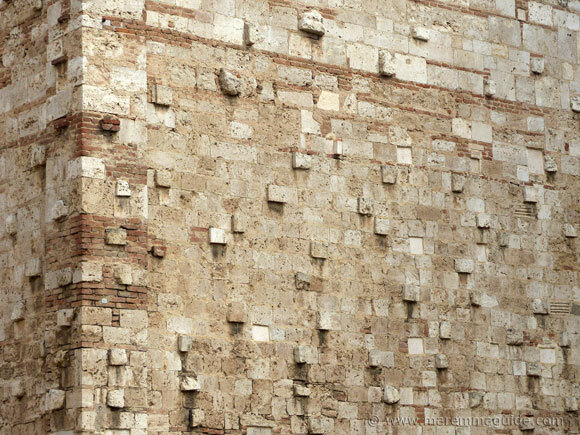 But why were the walls built in the first place? At such enormous cost and with a construction method that would withstand firearms of the Renaissance period? After all Grosseto isn't Siena or Firenze, nor ever aspired to be. It was sat near the sea surrounded by marsh, bogs and salt ponds. It took four million bricks to build the walls. It didn't have a thriving population: at most there a few hundred people living there when the Medici arrived and nearly all of them abandoned it for high ground between April and October of every year - a move called the "estatura" - with the city's public offices transferring to Scansano. Why? Simply put: the female mosquitoes that killed indiscriminately with the Plasmodium parasite they carried. The average lifespan then was little more than twenty years. Well, the history is tomes and tomes long, but in short, it went like this. 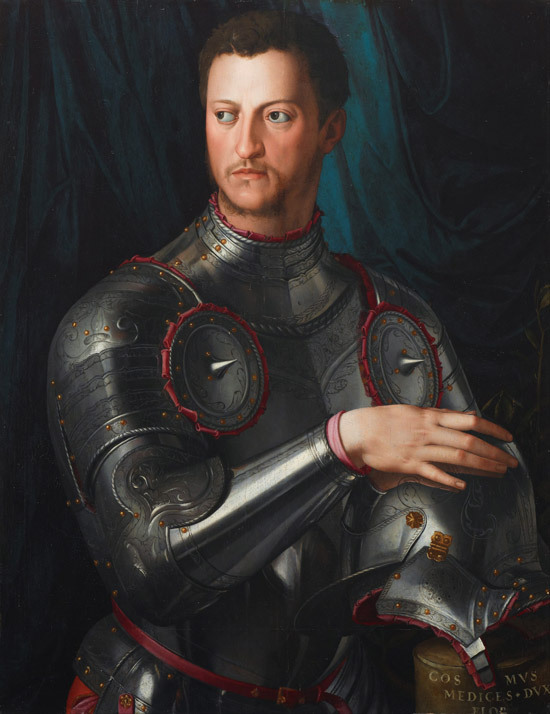 Cosimo I de Medici in armour by Agriolo Bronzino, circa 1545. At the conclusion of the Last Italian War in 1557, when the Florentine Medici family led by Cosimo I de' Medici took possession of the rule of the Republic of Siena, they also came by a large part of Maremma, including Grosseto. But didn't much favour their fortunes there. But not because of fear of Maremma's bandits, infamous and villainous as they were. But because to the south and not by very far, lay the territories of the Spanish in Italy with impressive garrisons - the "Stato degli Presidii" at Orbetello, Talamone, Ansedonia, Porto Ercole and Porto Santo Stefano in Monte Argentario, and the island of Giannutri and Porto Longone on the Isola d"Elba - who effectively ruled much of Tuscany's long coastline. And the Medici didn't trust them. More than that, the Crown of Spain's overwhelming influence over his newly-acquired Tuscany "irritated" Cosimo no end. That the Spanish presence riled him is despite the fact that Emperor Charles V (also King of Spain) and his son Philip II, had given Cosimo military support in his war with Siena and in July 1557, had handed over the Republic of Siena and its lands to him. But not all of them. And herein lies the rub. For the Sienese coastal strongholds and territories they kept for themselves, establishing the State of the Presidi: five cities, including Talamone that was still held by the French. And who wouldn't have? For in the Tyrrhenian sea ships sailed close to the coast, and these strategic ports effectively enabled them to monitor all sea activity from Genoa to Naples. Prizes indeed. But Cosimo never acted against the treaty. He even raised troops against attacks by the French, who in April 1558 attempted, unsuccessfully, to capture Orbetello. Five months later, in September the Spaniards crushed the French at Talamone. And Saracen pirates who repeatedly ravaged and lay waste to Maremma's coastal towns and villages. Looting and murdering as they went, taking every young fit man and woman to be sold at Ottoman slave markets and daughters into harem captivity. Beheading or burning alive the rest. Maremma's coastline wasn't far from their African bases, they planned their attacks with care and confidence and, despite coastal lookouts, nearly always did so with sudden surprise. Grosseto's medieval walls, entrance gates, and a 1444 Sienese built keep, didn't do much to ease the first Grand Duke of Tuscany's concerns and his mind was made-up. He was going to transform his new outpost into an impregnable military base. Today, twenty-first century street art meets sixteenth century Medici fortress walls. A contentious decision by the Comune di Grosseto (local authority) to allow it. Lots of people like it, lots don't. Note that the guards post at the top of this angle in the wall points into the city! The military of the day had to guard against local unrest as well. 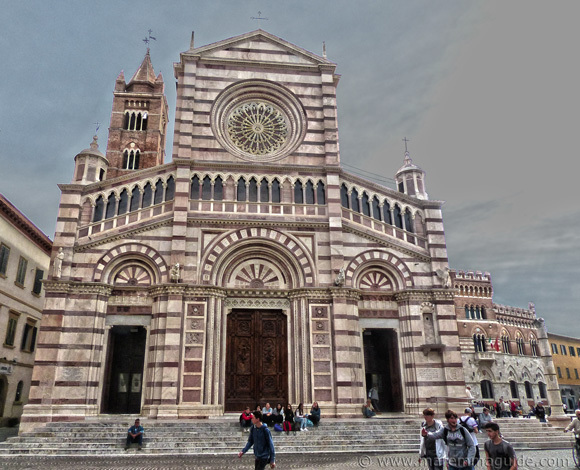 Grosseto cathedral - it's "duomo", "Cattedrale di San Lorenzo" is a bit of a patchwork affair. With a beautiful facade - for the most part - of local warm pink and white Caldana marble, and a stunning starred cupola ceiling, it sits on the site of the original medieval parish church of Santa Maria Assunta (earliest records date from 1015) which didn't meet the more lofty needs of the diocesan seat when it transferred from Roselle to Grosseto in 1138. It is home too to a much loved Virgin Mary with a solid gold crown (see below), a baptismal font by Antonio Ghini, and two stained glass windows by Benvenuto di Giovanni, the same coloured lights from which that you see radiating on the floor of the cathedral today would have lit upon the its first ever congregation - it was built between 1294 and 1302. 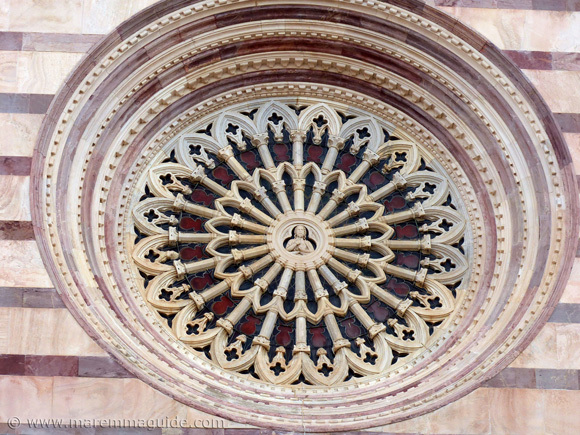 The rose window with the "Redentore", Redeemer, at its centre. But just a tip: it has to do with the roof that was raised. The harrowing story of "la Maremma" in marble. This isn't any foot standing on any serpent. The child in this woman's hands is her dead son. Her second son she is entrusting to a man who started a hundred and fifty year long labour that changed Maremma forever. Leopold II of Lorena, the Grand Duke of Tuscany, whose programme of land drainage and reclamation metamorphosed the landscape of Maremma, reducing its infested marshlands and with them the heavy death toll from malaria. 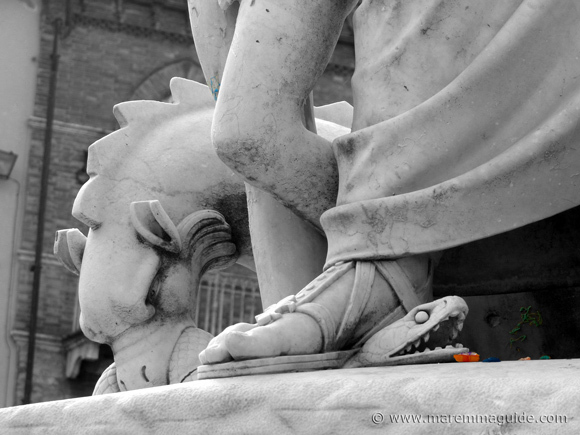 The monument was erected in his glory in Piazza Dante in 1846: the snake he is squashing under his foot is malaria, and the woman, she is Maremma. Tiny, and in the midst of rurality it may have been, but Grosseto in the first half of the thirteenth century was the birth place of a man considered to be amongst the first, if not the very first, writer of the Italian language, one Andrea da Grosseto (Andrea from Grosseto). Of humble origins, Andrea is thought to have been influenced by the annual winter guests of the Aldobrandeschi family who owned Grosseto at the time, the Imperial Court of Federico II di Svevia, who came to Maremma for its excellent falconry. His 1268 translation of the the Moral Treaties of Albertanus of Brescia from Latin into vernacular Italian is considered to be one of the most remarkable documents of the Italian language. 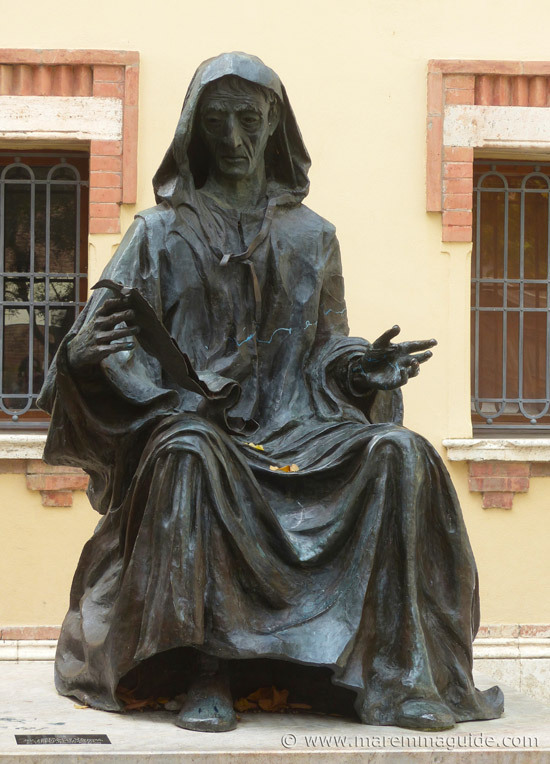 His monument in bronze was commissioned by Professor Oscar Brown, Dean and founder of the School of Art school in Grosseto, and sculpted by artist Arnaldo Mazzanti in 1973. You can see it in Piazza Baccarini, opposite the Archaeological Museum and Art of Maremma. There may well be a museum of art in Grosseto - in fact there are two, one on floors above another, - but the city's most important piece of art, indeed, arguably the most important piece of surviving art in Tuscany, if not Italy - you won't find inside either. It is inside the Chiesa di San Francesco (Church of Saint Francis). 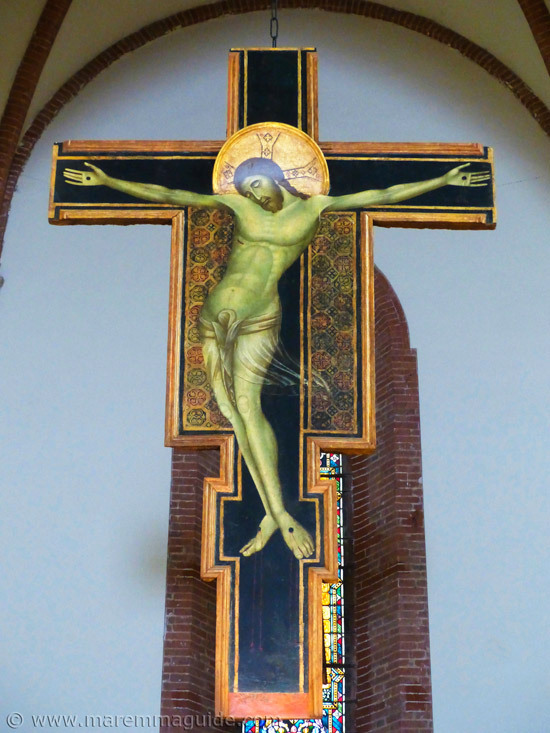 A "crocifisso" (crucifix) by Duccio di Buoninsegna. Considered revolutionary in its time not only for its humanised and supple representation of Christ, but also for Duccio's depiction of flowing, sheer, transparent fabric. 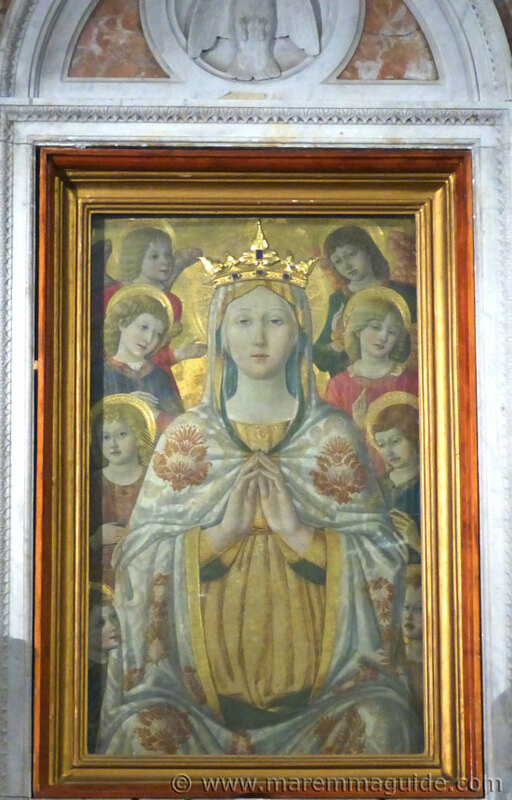 In the chapel of Our Lady of the Grace in the left transept of the duomo is the revered " Vergine Assunta con angeli" - the Assumption of the Virgin with angels - known as the Madonna delle Grazie and much adored in Grosseto. considered to originally have been the central part of a much larger work by artist Matteo di Giovanni, circa 1470. Her gold crown was added in 1759. On either side of the painting, in locked glass-fronted cabinets, locals leave tokens of prayer. But you won't find them in the cathedral. 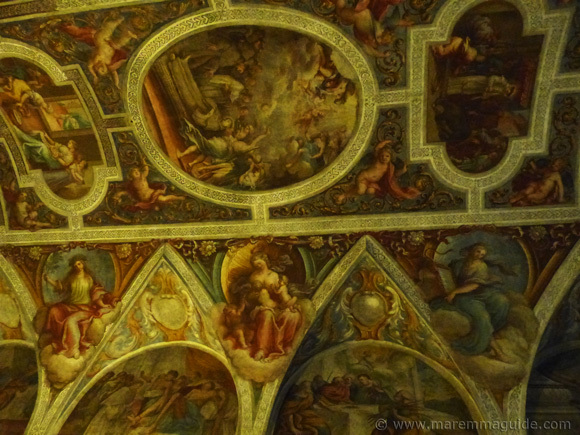 There is a right transept chapel that most people miss, even when they pass right by its entrance, the ceiling and walls of which are covered by frescoes that will literally have you on your knees trying to capture them. They were painted by Baroque Sienese artists, father and son, Antonio and Francesco Nasini and you will find them in the chapel of San Antonio, inside the same Chiesa di San Francesco that is home to the Duccio di Buoninsegna crucifix. This is just a section of the ceiling. The light is dim inside and, embarrassingly, I'm still in automatic press and shoot mode on my camera, so this is the best I could do. Those of you who have mastered the frightening manual aperture and speed functions will do much better than me. 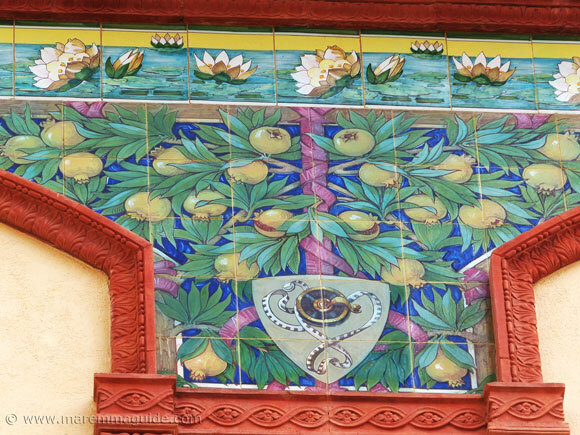 Outside in the streets of Grosseto, the display of art continues. Grosseto will surprise and delight lovers of the Liberty style, for along its main thoroughfare there are no less than three Art Nouveau buildings, and another - an important historic event when it opened in October 1926 - is the tucked away behind Piazza Dante, waiting ever so patiently to be rescued and restored whilst literally, crumbling away. 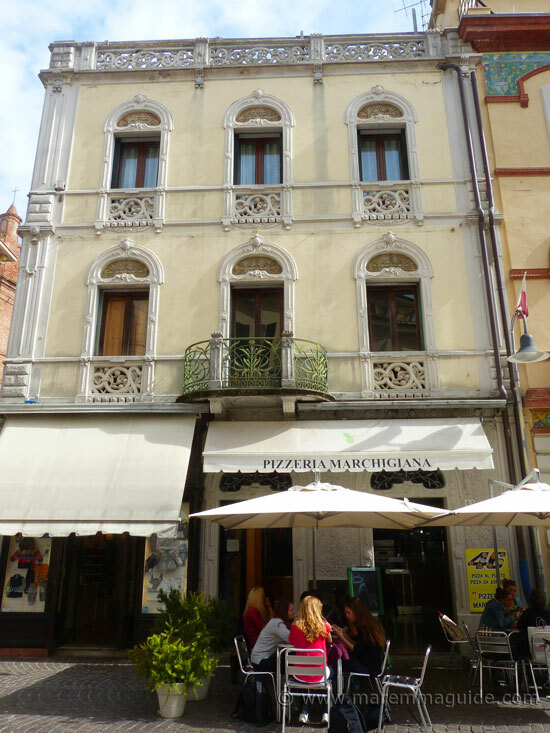 Grosseto's most obvious Liberty building is Palazzo Tognetti on the corner where Corso Carducci - Grosseto's main shopping street - meets via Cairoli. Palazzo del Genio Civile - The Palace of Civil Engineers - was built as the new home of the office of Civil Engineers and opened in 1911 with shops on its ground floors and municipal office above and behind. 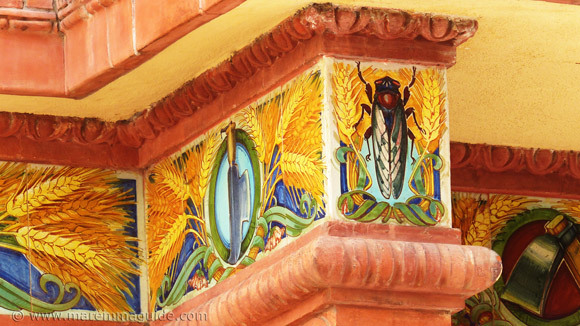 The designs on the decorative ceramic tiles on its facade might surprise you when you spot the insects and agricultural tools. They represent "la Maremma", and the drainage and hydraulic control of her lands that these same civil engineers enabled, that brought with them agricultural prosperity. 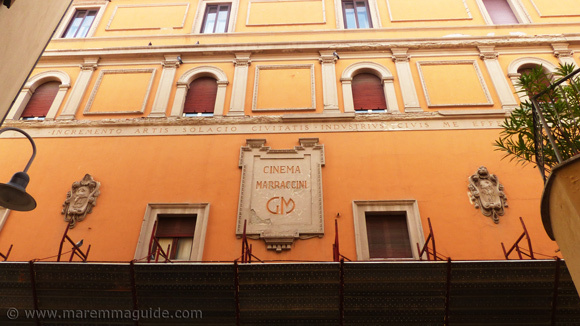 The very first cinema in Italy opened in Pisa in 1923. Grosseto opened its own in grand Liberty style just a few years later on 11 October 1926. Designed by Renato della Rocca, it had a roof that opened above the cinema-goers to periodically let out the accumulation of smoke from its cigar and cigarette smoking clientel during the performance. Just one example of this small rural city always wanting to be at the forefront of modernisation. It closed its doors for the very last time seventy-seven years later, nearly to the day, on 10 October 2003. Recently listed as a building of public interest and so "protected", it now sits enclosed within scaffolding to protect passers by from its crumbling edifice. 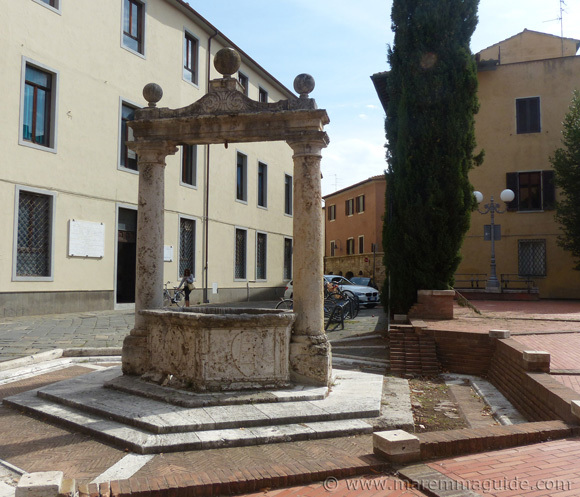 Grosseto had four city wells. Today you can see three, but there were four within it's walls. Il Pozzo delle Spedale, built in 1465 by the then Hospital of Grosseto - located on the eastern-side of Piazza San Francesco and now a university building - was built to supply water to the hospital and to the residents of the northern part of the city. Unfortunately, it was never very plentiful. Pozzo delle Spedale, built in travertine stone. Just round the corner, but this time not in a public location, if you peer through the wrought-iron gates of the cloister of the monastery of Saint Francis - the "chiostro di San Francesco" - you cannot miss the huge well of, Il Pozzo della Bufala. It was built for the monastery in 1590 by Ferdinando I de' Medici, the Grand Duke of Tuscany, as compensation for land that they had had to surrender to the Medici for the expansion of the city's walls and to replace the monks original well that was demolished on those lands. It is an impressive structure in travertine stone - that holds a cistern into which it is still possible today to channel water into - and much, much larger than they could have ever needed. The third is Pozzo della Fortezza, also a combined well and water cistern built by the Medici in 1590, located on the highest ground within Piazza de Armas inside the Bastion Fortezza. 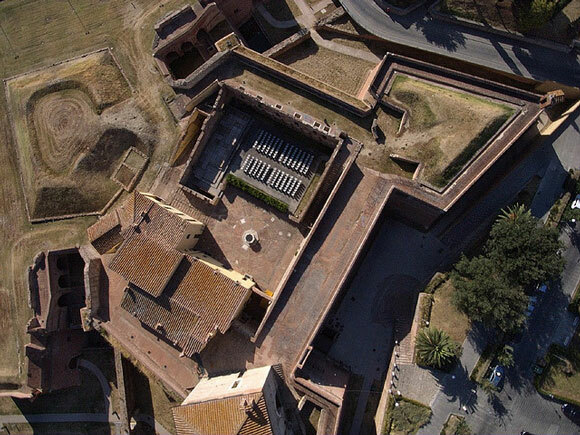 You will need to visit Grosseto during the summer months when the Bastion is opened to the public to see it. It's above ground octagonal structure belies the massive system of hydraulic engineering that lies below. Engineering that enabled the collection, purification and storage of up to 500 cubic metres of rain water in a central main tank and eight smaller lateral tanks beneath the piazza. The travertine well you will see today has seen other homes! During the course of its more recent existence it has been removed, dismantled, restored and returned to its original spot. The fourth public well has "disappeared" and it's monumental structure now sits in another town. Ask Natascha where! When you are stood with Natascha on top of the city's walls looking down at the original and only "porta" gateway into the city, she will tell you that Grosseto was, like Piombino further north up the coast of Maremma, a salt city. That its wealth and fortune were based for a long time on its nearby salt flats. Salt that was transported by ship up river to Florence from where it was sold at market and exported. You will realise, perhaps for the first time, that Grosseto was once a port. And she is telling you this here because from this vantage point she can show you - nearly within arms length - how close the banks of the River Ombrone were to "Porta Vecchia". I blinked with some disbelief. And therein lies the change of fortune of Grosseto and its trade: for practically overnight, a great flood changed the course of the river, moving it south, abandoning Grosseto's port. Today, the closest point of the River Ombrone is to one of its horse-shoe bends 1.39 km south of the gateway. Whilst two generations of Tuscans will remember well the great floods in the early hours of the morning of 4 November 1966, most famously, when the River Arno flooded the centre of Firenze. Not many visitors will know that many other towns and villages in Tuscany were similarly affected. The River Ombrone broke its banks on that same morning and brought flood waters up to 3.5 metres high into Grosseto's historic city centre. 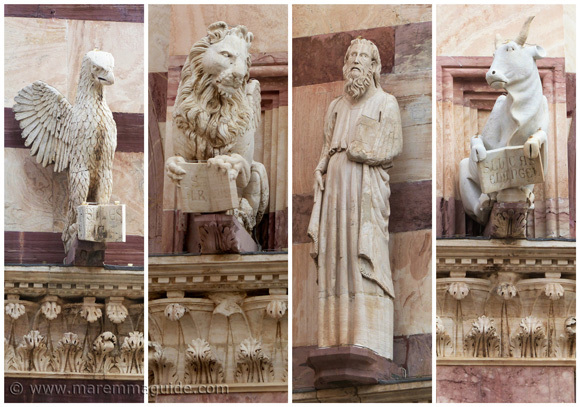 There's still a lot more to see in Grosseto. On the corner of the "duomo" in Piazza Dante, the "colonna Romana" - Roman column - that was covered in bill posters during the medieval period, but doesn't belong to Grosseto! Medieval stone decorations stuck onto the front wall of the oldest church in Grosseto, but they shouldn't be there either! That well I mentioned that disappeared. And a whole level of under your feet archaeology that keeps being unearthed whenever construction within the city walls takes place. A piazza of remains and odd bits left open to the elements for you to see/sit on. But without any signage! You'll need a guide to tell you what they are. The 1444 Sienese keep within the Medici fortress in Bastione Fortezza, open in the summer for show, concerts and with a piazza bar. 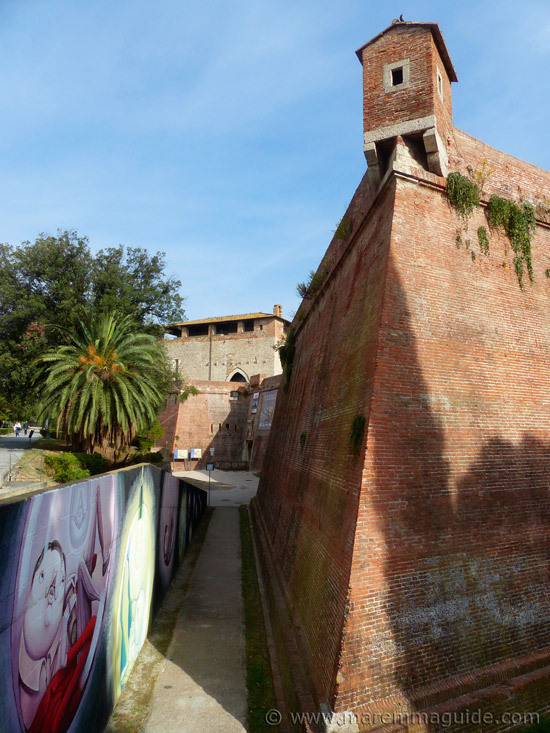 Like the the lovely city of Lucca, Grosseto's magnificent city walls are still entirely intact and, just like in Lucca, you can walk or cycle around them. You'll walk past a prison too - still in use - inside them. 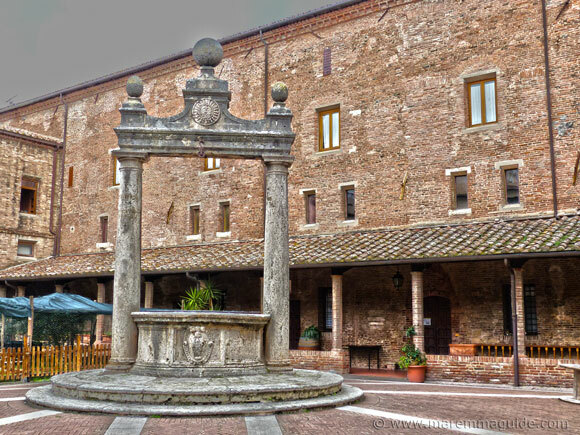 Grosseto has three museums all within it's city walls. In fact, Grosseto is perfectly made for strolling leisurely between one sight and another, with coffee stops and some shopping along the way. The Museum of Archaeology and Art in Maremma, home to the whole Etruscan and Roman story of Maremma. Vetulonia, Vulci, Heba, Chiusi and Cosa, Roselle, Saturnia and more. And filled with artefacts: Etruscan funeral urns, buccero bowls and Corinthian vases, terracotta womb fertility gifts once offered-up at the now vanished Canicci di Paganico hot springs. And a procession of marble Roman life-size statues. All spread over three floors. It is an big and impressive museum. If the panels in the cathedral and church of San Francesco have whetted your appetite for more religious art, the Museum of Sacred Art of the Diocese of Grosseto - where most of the cathedral's own art pieces together with those collected from local churches are stored - has many more. 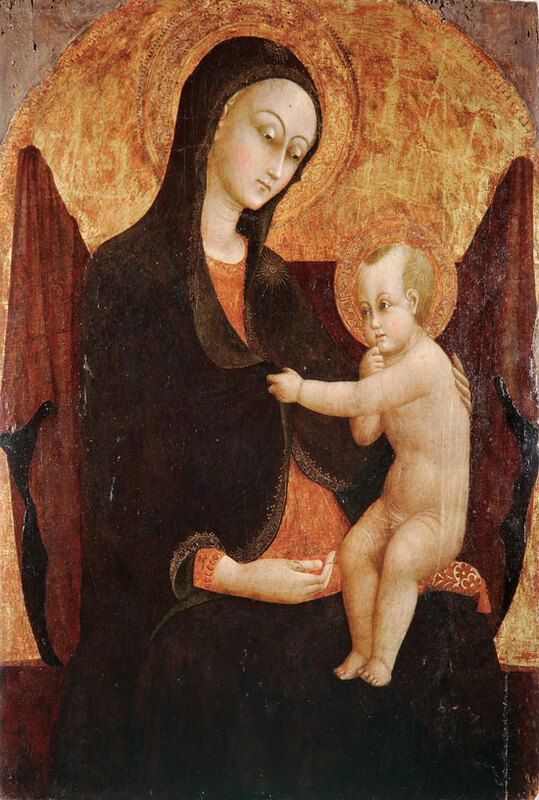 Including a beautiful fifteenth century panel, entitled "Madonna delle ciliege" (Madonna of the cherries) by Stefano di Giovanni, the artist also known as "Sassetta". As well as a 14th century reliquary said to contain a fragment of Grosseto's patron saint, San Lorenzo, held by the Bishop at the forefront of the city's annual parade on the day of the Festa di San Lorenzo. Once a private collection of the cathedral's art and pieces collected from local Diocese churches on display in the sacristy of the duomo, you can now find it in the Palazzo del Vecchio Tribunale (Old Court House) building, along with the Museum of Archaeology and Art in Maremma, in Piazza Baccarini. The Museo di Storia Naturale della Maremma and the "enigmatic hominoid"
Grosseto's Museum of Natural History is home to an eight million year old fossilized skeleton of a monkey that for a while was thought to be the missing link in the evolution of man. It's find two hundred metres underground by miners in Maremma's last lignite mine - just days before it was due to permanently close - in Baccinello late into the night of 1 August 1958, when a whole gallery collapsed and he appeared in its ceiling, made international headlines. Other fragments of this Oreopithecus bambolii walking tall, finger pinching, hominoid primate - bone and teeth - had been found in lignite seams in Maremma, including those of Montebamboli near Massa Marittima, Montemassi, and Ribolla - but this monkey was whole. The miners called it "Sandrone" and his scientific classification as a modern Miocene ape is still being debated and, depending upon the outcome, could re-write the palaeontological map as we know it. Lots of "Sandrones" lived in Maremma when this part of Tuscany and Sardinia was an isolated island. If that was my "taster" as to what Grosseto has to offer as far as attractions go, imagine what more you would get to see and learn about during a private tour of your own with Natascha. Don't waste your valuable time doing all the research. And don't miss something you would have loved to have seen, if only you had known it was there! Contact Natascha via the email messaging form below. Let her know when you are thinking of visiting Grosseto, how many are in your party, and if there are any particular things you already know you would like to see.